Vellore is situated 145km from Madras. The town is famous for its 16th century Vijayanagar fort and the Jalakanteshwara temple, from the same period. 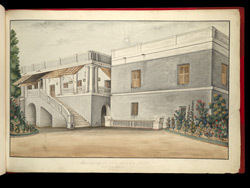 The British occupied the fort in 1760 after the fall of Tipu Sultan in nearby Srirangapatnam and built many colonial buildings in the town to house its administrative workers. This drawing os of the adjutant's bungalow; the adjutant was responsible for all organizational matters with regards to sections of the army.